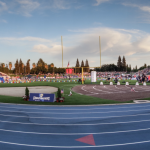 Saturday, May 13, 2017 12:00 AM Place 7 Points 44 Meet Recap Girls Track & Field Results: It was a beautiful day for track and field Saturday at the Metro Classic. Metaling for the Trojans Ariel Clowney (200), Therese Hebda (400PR), Victoria Hebda (3200), Lauren Mator (3200), Sydney Voss (HH, LH, HJ), Nicole Lasich (PV). Friday, April 28, 2017 3:30 PM Place 2 Points 120 Meet Recap Girls Track & Field Results: The girls took 2nd at the Marauder Invitational. Ariel Clowney was the 100 and 200 meter champion; the 4×100 Relay meet champions of Nicole Lasich, Hannah Doree, Sydney Voss, and Ariel Clowney; and 400 meter champion Therese Hebda. 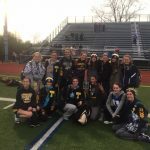 Tuesday, April 25, 2017 3:30 PM Place 1 Points 98 Meet Recap Girls Track & Field: Congratulations to the Girls Track & Field Team; they stuck it to the Marauders winning 98 to 38. Placing first 4×800 Relay (Mator, V. Hebda, McClelland, Gorno), Sydney Voss (HH, LH), Ariel Clowney (100, 200), 4×200 (M. Clowney, H.
On Saturday, June 4th nine Track and Field Athletes traveled to Zeeland, MI to compete in the MHSAA Division 2 State Championship Meet. 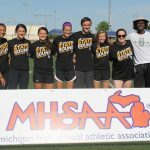 Five of those athletes were named All-State! The girls 4x100m team of Abby Lefevre, Nicole Lasich, Ariel Clowney and Izzy Olds placed 2nd with a time of 49:34 and were named All-State.